The journey can begin dropping in Breno Maniva through the Pass and Pass Crocedomini just 20 km from the hotel: one of the paths considered among the most beautiful in Europe. Moving from Valcamonica through the Pass Vivione encounter the spectacular Via Mala. Then there is the nearby Passo della, the Passo San Marco, which with its 2000 meters brings us in contact with a high-mountain landscape and the Mortirolo and Aprica Pass. Unique and unmissable is the Passo Gavia where snow reigns supreme and the mountains are a dazzling white … almost difficult to describe the splendor, from here you can descend to S. Caterina. You can then take the road that leads to the Forni glacier: the waterfall, the view over the valley, on the rocks, glaciers … will be only yours. Valcamonica is covered by the new bike path that runs through the Vallecamonica from Capodiponte Pisogne. From the center of Breno climbing towards the Passo Croce Domini. After the first initial steep section, the climb becomes more affordable and exceeding in succession the ancient parish church of St. Maurice and the fifteenth-century shrine of St. Valentine … After the small village of Pescarzo, the panorama becomes wider and showing Breno the Castle, the Middle Valley, the course of ‘Oglio and Concarena; we are now, as indicated by signs in the vicinity of the boundary of the Park ‘Adamello, which contains within it some of the most beautiful valleys and mountains of Brescia side of the group of mountains. the other to the right you go down Bienno, where you can visit: the old town with its palaces and its medieval towers and the church of Santa Maria where you can admire the frescoes by Romanino and Pietro da Cemmo. Going in the direction Breno, still worth a visit: the sanctuary of St. Mary Magdalene with the magnificent statue of Christ the King with el ‘Hermitage of Saints Peter and Paul. 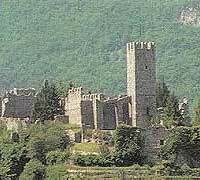 The last portion of descent shows us all the grandeur of the Castle of Breno, built no different eras and witness of ancient stories.